Are you looking for the perfect pairing of table and seating for your next big event? No matter the occasion, we can help you find the perfect dining room furniture set that is not only accommodating, but also beautiful. We have a wide variety of tables that come with chairs, stool, and even benches. Stop into Encore Consign + Design to set the tone of your dining room with casual or formal pieces, with modern and rustic styles. At Encore Consign + Design, we are prepared to assist you with the sale of your furnishings and accessories. When you choose to consign with us, you will have the opportunity to leverage our extensive marketing efforts to find the right buyer. This requires little to no effort on your part and none of the risks that are associated with direct selling. To learn more about the benefits of consigning with us, please click on the button below. Your dining room is where you entertain family, friends, and other guests. You create beautiful memories around the dining table that last a lifetime. Finding the right furniture to be both accommodating and elegant can be difficult on your own. With our beautiful and practical dining room sets, you will be able to create more beautiful memories without the hassle of searching through store after store. At Encore, we have made it easier than ever before to create the home of your dreams. 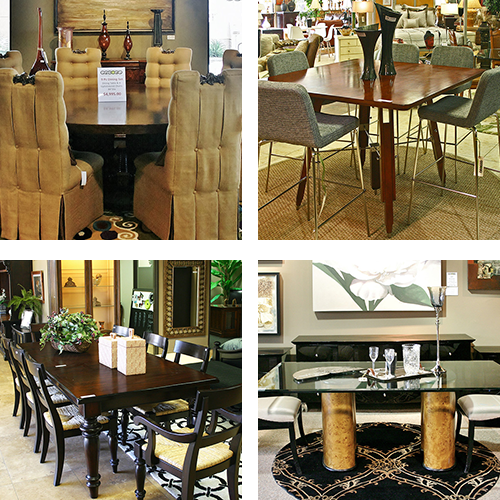 To start shopping our consignment dining room furniture, we invite and encourage you to visit us today.